Samsung was recently granted a patent for a smartphone with a transparent display with both front and back-touch. The Samsung patent takes display technology beyond flexible displays and into the realm of science-fiction by putting a see-through display on a smartphone. 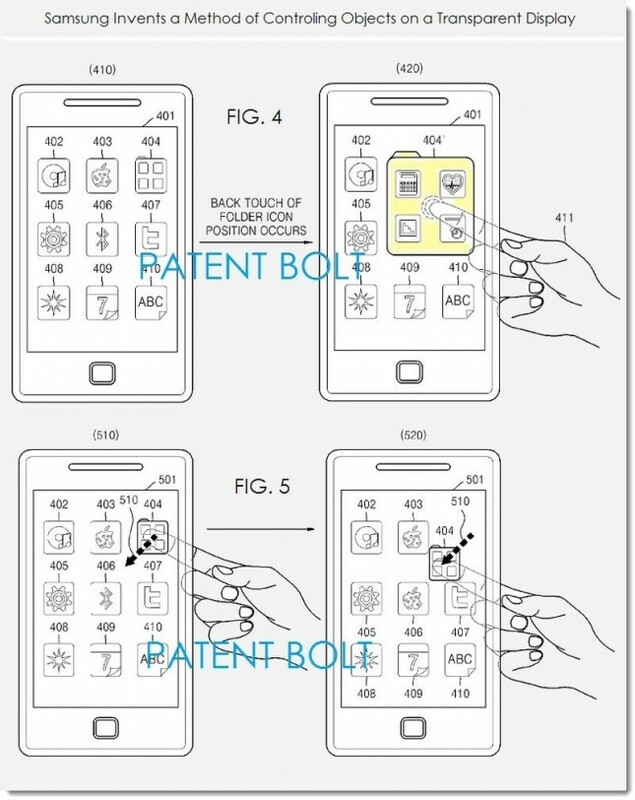 The patent describes several ways that users might interact with a smartphone with a transparent display, which fluctuate between a replacement for the AirView feature of the Galaxy Note 3 and the back-touch features of the PlayStation Vita. Many of the uses of the transparent display outlined in the patent seem to solve the problem of having a finger obscure parts of the screen when interacting with the phone. For example, when opening a folder on a current smartphone you have to move your finger out of the way to view every app in the folder. With a transparent display, however, users can open a folder by touching it from behind, making all icons easy to see with no fingers in the way. The feature is very similar to AirView on the Galaxy Note 3 and Galaxy S4 which lets users view the contents of folders by hovering their stylus or finger just above the screen. The back-touch can also reveal text hidden in a menu similar to AirView in the Samsung Email app in the aforementioned phones. Also outlined in the patent is the ability to interact with two overlapping elements at once. Users can move the top element using the touchscreen as normal, and move the bottom element using the back-touch on the transparent display. This same feature is possible on PlayStation Vita games thanks to the touch panel on the back of the handheld. On the Vita it’s sometimes difficult to know exactly where you’re touching on the touchpad, but with a transparent display it should be easier to know exactly where you’re tapping at any time. A patent on transparent displays doesn’t mean Samsung intends to release devices with those displays any time soon. A transparent display would also require transparent electronics inside the phone, which may make the implementation difficult. For now it seems the most innovative display technology Samsung is ready to talk about is the flexible display in the Samsung Galaxy Round. Do you think a transparent display is feasible any time soon? Would you buy a phone with such a display?